Kelty Foraker -15: This sleeping bag is insulated with 750-fill power goose down for warmth, and it’s great for roominess and sleeping comfort. This winter could have been much colder at times without the warmth of the Kelty Foraker -15 sleeping bag. Even with spring, and the promise of warmer days, the high-country and many regional climates require cold weather insulation well into summer; sometimes year-round. So here’s a four-season backcountry sleeping bag insulated with 750-fill-power goose down you can look to for warmth, comfort, and the decades of experience Kelty brings to the table for great outdoor equipment. For some folks, this Foraker -15 is too much sleeping bag for the majority of backcountry exploits they have in mind. But for those who know their adventures might lead them to a serious cold-weather on occasion and they’re frequently spending time at higher elevations year round, the Foraker will be a great option to consider. We reviewed the Kelty Foraker -15 in size Long and couldn’t be happier with how it worked out in a variety of cold to super cold temperatures. The lowest temperature we experienced was in the range of -5°, and it was clear this bag was good for much lower temperatures. This one is 86-inches long and 66-inches wide at the shoulder, both length and width are good for a freak 6’6” tall and tipping the scales at a good deal more than 250 pounds. That doesn’t describe this writer, but it’s great having all that room for the times when there is no sense in getting completely undressed to sleep when that little digital alarm clock is set to kick out Gun’s N’ Roses “Welcome to the Jungle” at three in the morning for an early wake-up, tea-up, and pack-up, and get that early A.M. jump-start on the trail. Zipper is two-way with locking capability…worked flawlessly. 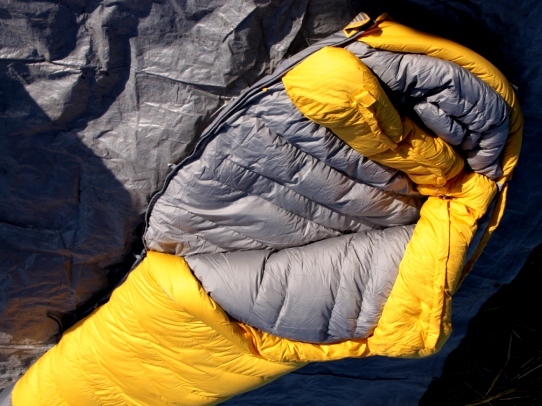 This is essentially a base-camp expedition-grade sleeping bag, and its design and construction are geared for warmth and rugged durability in rather extreme conditions. It’s a mummy design all right, yet there was never a sense of claustrophobia associated with body-tight pharaoh wraps. Foraker offers excellent room for those times when you do have to be partially or fully dressed. This is what is meant by “expedition cut,” you’ve got lots of room to sink into. And for this much sleeping bag, it’ll pack into a compression sack to about nine inches in diameter and 18 inches long with a total weight of approximately four pounds. That’s a lot of bag to carry, but when you need the warmth it delivers, you’ll have no problems transporting its weight and packed dimensions. It’s always a trade off in size vs. weight, although when you expect to bivouac in freezing weather you’ll want this level of insulation. 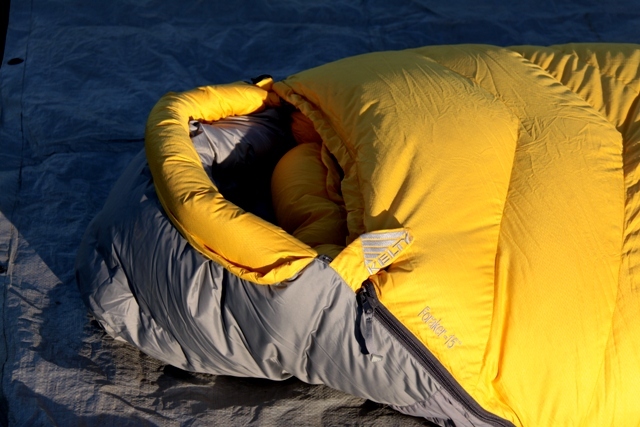 Heck, you’re down parka will weigh as much as a one-pound down summer sleeping bag. Your winter gear will always outweigh your summer super-light gear set. That said, it would be nice to have a second-level compression system to contain the Foraker -15 just a little bit more. Getting it into its factory stuff sack is very doable, but…mercy, it can be a challenge. That challenge is exasperated when you have to pack up on the trail and lash the bag to your backpack. Because it is a more significant bundle, it won’t readily fit into sleeping back compartments built into some of the nicer backpacks available. Out of the stuff-sack, Foraker -15 lofts up quick. Once out of the stuff sack, the Foraker -15 lofts up very quick. We liked that, as the 750-fill power goose down is immediately available to provide warmth and insulation against dropping evening temperatures. The exterior materials are absolutely expedition grade and hardy enough to slough off some of the inescapable abrasion forces that often come with backcountry living. Welded, waterproof seam connections are used at both the foot of the Foraker and the hood areas. This is a great benefit when you find yourself in valley bottoms or super high moisture conditions where early mornings often result in frost build-up on the sleeping bag; especially when you are sleeping without the cover of a tent. Down insulation is managed throughout the Foraker -15 with trapezoidal-baffle construction. However, were pretty sure the high loft value of the 750-fill power down is responsible for the quick puff-up capability when you drag the bag out of the sack. Perhaps, the one thing we enjoyed most about the Kelty Foraker -15 is that peace of mind you get when you have no doubts you will be warm enough. That quality is only trumped by the generous roominess and comfortable materials lining the bag which function to offer that one thing we so often give up when we leave our king-size pillow-top beds at home, the ability to get cozy and fall sound asleep. 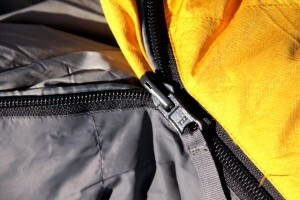 The draw chords and insulation-filled collar in the hood area can easily be adjusted while you’re in the sleeping bag. Waterproof hood seams, double collar, and adjustable fit offer full mummy wrap and warmth. At the foot of the Foraker there is a nice depth to the chamber, or pocket area, between the zipper and the end of the sleeping bag. This pocket really helps when you are getting into the sleeping bag in the black of night; it a target you always know you’ll hit in order to snuggle back into the bag. It was no surprise to find the two-way composite zipper worked flawlessly regardless of the temperature and level of consciousness. There were the few occasions where the zipper catches the insulated seals, but never a full on snag. Velcro fasteners at the hood provide a greater level of button-down capability for those times when you pull all the stops for making sure you are going to be as warm and safe as this Foraker -15 is capable of delivering. It would have been great to actually, scientifically measure out -15° in a controlled environment to be able to report back just how this sleeping bag performed at that exact temperature. But keep in mind, these temp ratings are always just an estimation based on laboratory-like scenarios. We’re fairly confident the Foraker -15 is capable of dealing with much colder conditions. And likewise, we were able to use this sleeping bag in much warmer conditions than one would think it would be used for. When you are operating in wicked cold conditions, more than likely you will crawl into your sleeping bag with most, if not all, the clothes you’ll need to get up in the middle of the night to water the plants or fire up the stove and tea-up for a super early departure. So there’s so many potential variables and, mostly cold weather, conditions where the Kelty Foraker -15 is perfectly adaptable and useful, the only person who should judge it too warm or too much sleeping bag is the person who will sleep in it. For our various applications of using sleeping bags on backpacks, four-wheel drive excursions, or overnighters at a friend’s cabin, this bag proved super flexible and comfortable. For example, here’s another end of the spectrum we couldn’t have speculated on: when temperatures in the tent or on the ground were closer to just freezing or 15° above zero and warmer conditions, the Foraker became an outstanding feather bed that doesn’t require being zipped up tight as the mummy style bag it’s capable of. There’s plenty of latitude to adjust the comfort range upwards when the situation dictates. For early spring and early summer trips in the higher elevations, the Foraker -15 can just as comfortably be used as a quilt or a mattress you can pull the covers over you when it gets cold. Just the comfort provided by the highly efficient lofting capability of this bag makes it a go-to sleep factory as long as you can adjust the heat it’s capable of…and in many cases you really can adjust the warmth. I read this… and bought the sleeping bag. Its not in yet, but i’m really excited. I just read it again.